Overrun with art galleries, luxury condos, bars and hotels — Chinatown has lost approximately one fifth of its Asian population and thousands of rent-regulated apartments over the past 15 years. It’s gentrification run amok. On Friday night, roughly 100 people gathered outside the Hester Street Playground at the bustling intersection of Chrystie and Grand Streets in the heart of Chinatown. 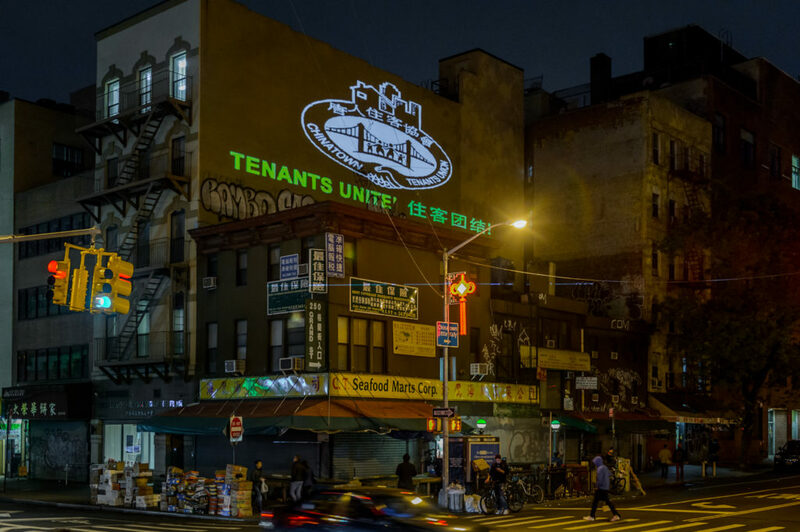 Across the street, images of anti-gentrification agitprop were projected on the side of a five-story tenement building that loomed above the crowd. 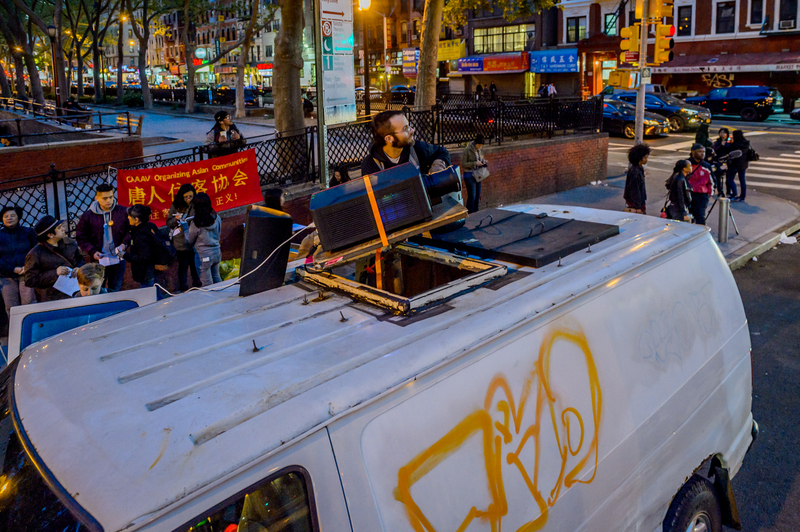 The event was organized by CAB, CAAAV Organizing Asian Communities, the Chinatown Tenants Union and The Illuminator, an art-activist collective that has staged hundreds of projection-interventions in public spaces since it was founded during Occupy Wall Street. Before the screening, members of CAB attached a long vertical red banner to the entrance of the Hester Street Playground that read “Chinatown Not for Sale” in black Chinese characters. Pamphlets were distributed in both English and Chinese with information on renters’ rights in New York City. Elderly Chinese residents passing by were greeted and given information in Mandarin by friendly volunteers. 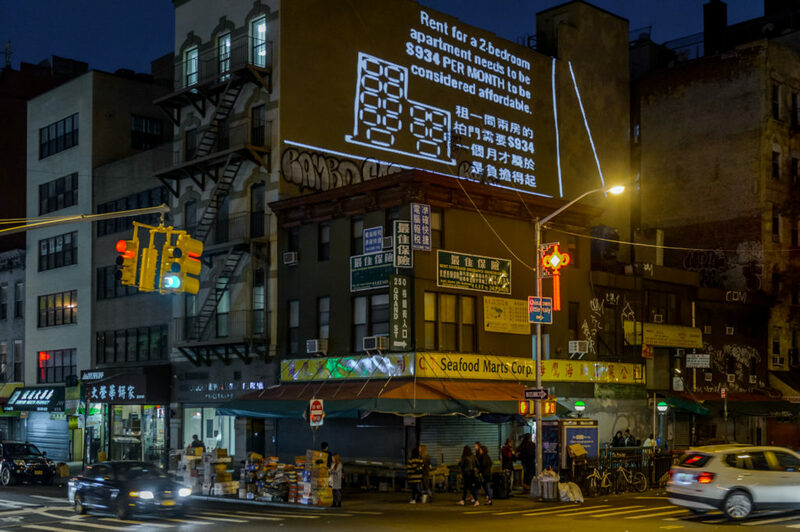 After speeches by local residents and songs from a Chinatown youth group, The Illuminator began projecting curated images, messages of support and digital art from across the United States and around the world. The crowd was encouraged to write their own messages on the “People’s Pad” which projected their giant-sized words in real time on the side of the wall. One woman wrote that her aging mother hopes to win an affordable housing lottery and be able to move back to Chinatown where she lived for 17 years until she was priced out into Bensonhurst, Brooklyn. “If she could come back here, she could just walk out of her home and hang out with her friends,” said her daughter Karen, lamenting the one-hour commute her mother undergoes to visit her old neighborhood. There are 110 galleries in Chinatown, the majority which arrived in the past five years with some paying as much as $25,000 per month to rent a small storefront. The median yearly income for a family of four in Chinatown is $37,362, according to the Pratt Center for Community Development. CAB and CAAV are working together to pressure Mayor Bill de Blasio and his administration to approve a community-led rezoning plan that will restrain neighborhood growth and preserve Chinatown’s working-class character. The plan has been largely ignored by the de Blasio administration. The neighborhood’s City Council member, Margaret Chin, is looking to preserve a small section of “core Chinatown” south of Canal Street while leaving the rest unprotected from the ravages of gentrification. 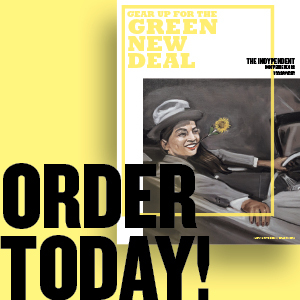 John Tarleton contributed reporting to this article. Photos: The Chinatown Art Brigade at work on May 12, at the corner of Christie and Grand Streets in Manhattan. Credit: Erik McGregor.